Watch manufacturer Cartier sees the panther as the embodiment of elegance and beauty. The Panthère collection, dedicated to the eponymous big cat, reflects these ideals with its precious materials such as gold and shimmering diamonds. Cartier uses a panther as its logo. Jeanne Toussaint, the company's creative director and confidant of Louis Cartier, introduced the panther as a stylistic element unique to Cartier. As creative director, Toussaint was also responsible for sketching the first Panthère wristwatch from 1914. The gemstones on the case and bracelet resembled the coat of the sleek predator. The round case framed a square dial with Roman numerals. La Panthère, as Toussaint was fondly called by Cartier, created numerous jewelry collections inspired by the panther, including bracelets, brooches, and necklaces. The panther developed into a coveted design feature and ultimately became the company's logo. Cartier relaunched the Panthère collection in the early 1980s. The watch manufacturer took these models in a new, modern direction, as they were all powered by highly precise quartz movements. The watches resembled the Cartier Santos, one of the first pilot's watches ever created, due to their similar square shape. 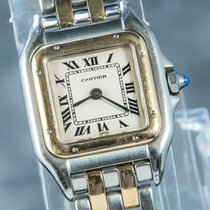 The Panthère quickly developed into one of the most popular Cartier watches. Another update came in 2017, and materials like yellow, white, and pink gold, as well as glittering diamonds, were introduced. There are even extravagant pink gold models with black lacquer used to create panther spots. How much does a Panthère cost? The Panthère series contains watches made of stainless steel, 18-karat gold, and bicolor combinations of both materials. Quartz movements power these unisex timepieces, meaning they only have to be corrected once every few months. Prices for a bicolor Panthère in good condition begin around 2,100 USD. 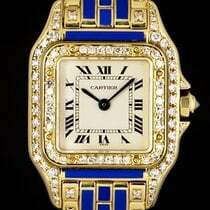 If you're looking for a gold watch with diamonds, plan to spend over 9,300 USD. Without diamonds, yellow gold watches can cost as little as 3,500 USD on a leather band and 4,700 USD on a gold bracelet. 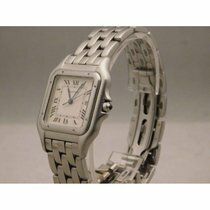 Never-worn stainless steel watches with a matching bracelet sell for around 4,100 USD. New bicolor models cost about 7,000 USD, while those with diamonds cost up to 23,300 USD. 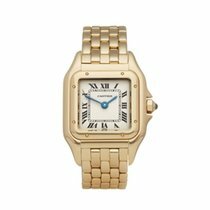 Mint-condition Panthère watches in solid gold sit in a similar price range. The pink gold edition with black lacquered panther spots is especially eye catching. A well-maintained timepiece demands around 22,100 USD, while its list price sits at 27,700 euros or about 32,200 USD. If you want to buy a round Panthère, you should plan to spend at least 1,200 USD. This also applies to the models with a wide band. The band surrounds the case on these models, making them more reminiscent of bracelets than standard wristwatches. If you're on the search for a mechanical wristwatch with an automatic caliber, the Santos and Tank collections are good options. The Santos costs less than 1,200 USD pre-owned; new, stainless steel versions cost around 3,500 USD. Unworn gold watches from this collection cost much more at around 11,600 USD. The Tank is available pre-owned and in good condition for less than 1,200 USD. New, however, the square timepiece costs around 2,200 USD. Inspired by British tanks, Cartier developed the Tank in 1917 during the First World War. Since its foundation in 1847, Cartier has been revered for its sense of style and the high-quality craftsmanship of their products. Gem-encrusted Cartier diadems, brooches, and rings are all especially popular among royalty. Cartier's customers have included Queen Victoria Eugénie of Spain, Queen Elizabeth of Belgium, and Queen Elizabeth II of England. The panther motif also appealed to Wallis Simpson, the Duchess of Windsor. In 1948, the Duchess purchased a panther brooch. Just a year later, she bought another featuring a panther lying on a 152-carat sapphire cabochon. A flexible bracelet in the shape of a panther was also part of her collection.